How has Semtech’s BlueRiver platform disrupted the AV market? There is a rich history of solving distribution problems by using Ethernet — once you successfully move a technology to Ethernet, there’s no turning back. We have seen this transformation with snail mail, CDs, DVDs, and cable TV. All of these services were disrupted when the standardized distribution mechanism became Ethernet-based. It is fascinating to see innovation evolve the way of doing “old things” like you never could have imagined. Of course, shifts in business models are always met with resistance from incumbents. Revenue is dramatically impacted when product offerings become antiquated. Our problem is distributing video. We address a very specific market with requirements for very high levels of quality, very low levels of latency and things that need to be in sync. We are talking about non-consumer, non-residential signal distribution of video. For example, if you watch a basketball game at an arena and there are displays showing live video, the visuals cannot be off by even a second. If you're at an airport and walking down the concourse with ten displays showing a video ad of some sort and the video is not in sync between these displays, that's a bad experience as well. Our market has very specific, extremely challenging technical requirements that have previously prevented the Pro AV industry from moving onto Ethernet because there wasn’t a technology available to solve these complex issues around uncompressed 4K streaming, zero frame latency and scalability. Semtech’s BlueRiver technology has done just that — we solved these challenges and more. How did this technology evolution come to be? A perfect storm had to come together in the marketplace. This is the first time in the history of video and Ethernet specifications where the requirements for video are actually in sync with the maximum, or mainstream, available bandwidth on Ethernet. Video in the past couldn’t transport within the bandwidth required on the mainstream Ethernet network of the day without using a proprietary network for distribution. Then came Gigabit Ethernet, a standard supporting one gigabit per second (Gbps). During this time, we had HD video available - which is 1080p - sending about 3.3Gbps. Again, if you wanted to distribute 3.3Gbps of video over 1G Ethernet in high quality, you couldn’t do it because you would need to use a high level of compression that wouldn’t meet the technical requirements of the industry. In these instances, custom hardware equipment was necessary to even consider distributing on a regular, standard network’s bandwidth. Now, we have 10G Ethernet. The best resolution of today is Ultra HD at 4K. At 30Hz it is actually 6Gbps. At 60Hz it is 12Gbps per second. In most cases video is below 10Gbps or, with a little bit of compression from 12Gbps to 10Gbps, you can get into this standard bandwidth easily. We have reached a first-ever tipping point where optimal video bandwidth and Ethernet bandwidth are matched. Instead of developing brand new, custom hardware and reinventing the wheel, we can use standardized hardware that has trillions of dollars already invested in its development. How has this breakthrough affected cost? Let’s look at pricing per port. 10 GB switches are now roughly one hundred dollars per port, whereas, if you developed custom equipment, it would cost users between $500 to $1,000 per port. We’re looking at a huge savings from a price per port perspective. We have resolved concerns with bandwidth and pricing. How is Semtech’s BlueRiver technology transforming the matrix? In terms of market development, it doesn’t make sense for anybody to distribute video over Ethernet using proprietary equipment, which is not future proof, scalable or upgradable. It does, however, make perfect sense to shift the market to a standardized Software Defined Video over Ethernet (SDVoE™) ecosystem. Semtech’s BlueRiver is currently the only technology available that can make this happen. The technology is truly transforming the matrix. BlueRiver provides matrix switch functionality using an Ethernet switch instead of a traditional matrix switch. 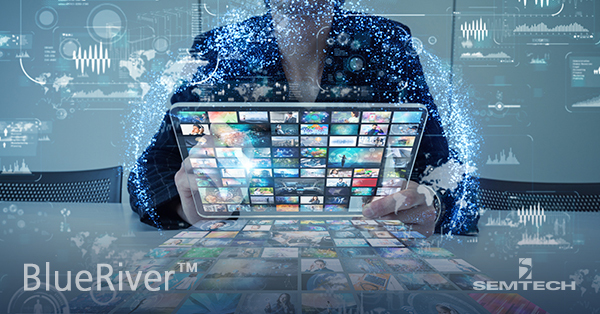 The BlueRiver platform consists of AV-over-IP chipsets and a comprehensive software Application Programming Interface (API). Equipment manufacturers are now building SDVoE-compatible solutions with BlueRiver at its core. The BlueRiver NT chipset series delivers a single, programmable system on chip (SoC), which can be used to replace traditional AV/KVM extenders, matrix switchers, video wall controllers, and windowing processors with a simple network of transmitters, receivers and off-the-shelf Ethernet switches. This is revolutionary. It’s the only technology on the market today that can pack all of the capabilities you need in an AV cable distribution or processing application environment onto a single chip with a software defined API. What are some of the main advantages of the BlueRiver platform for SDVoE? In the past, users would have had to buy a different chip for processing, a different chip for extensions, etc. For proprietary matrix switching, end users were forced to buy the transmitter, the receiver, and the switch from the same equipment manufacturer. But with Semtech’s paradigm, they just buy the transmitter and receiver from the same equipment manufacturer and then they select the switch from any switch provider in the world, based upon their specific needs and requirements. There is a new level of flexibility with SDVoE — you can pick and choose the best switch for your application and all of your equipment from different vendors and know that they will be interoperable. One of the greatest advantages is Semtech is the only provider of any kind of AV over IP, 1 GB or 10 GB, that actually has an alliance and an interoperable standard. With 1 GB providers, each one of them has their proprietary solution going over Ethernet, so they can work with any switch — but they won't work between manufacturers. Because everything from the API down is standardized and carefully controlled, SDVoE-enabled devices exhibit the style of interoperability previously only seen in the IT world. There are over 160 interoperable SDVoE-based products, powered by our BlueRiver platform, currently available on the market. The SDVoE Alliance™ is a non-profit organization of more than 40 member technology providers. The organization collaborates to standardize the adoption of Ethernet to transport AV signals in professional AV environments. The next generation of AV distribution has arrived, and we are proud to play a big part of the evolution of this market. BlueRiver is a trademark or service mark of Semtech Corporation or its affiliates, and SDVoE is a trademark or service mark of the SDVoE Alliance.